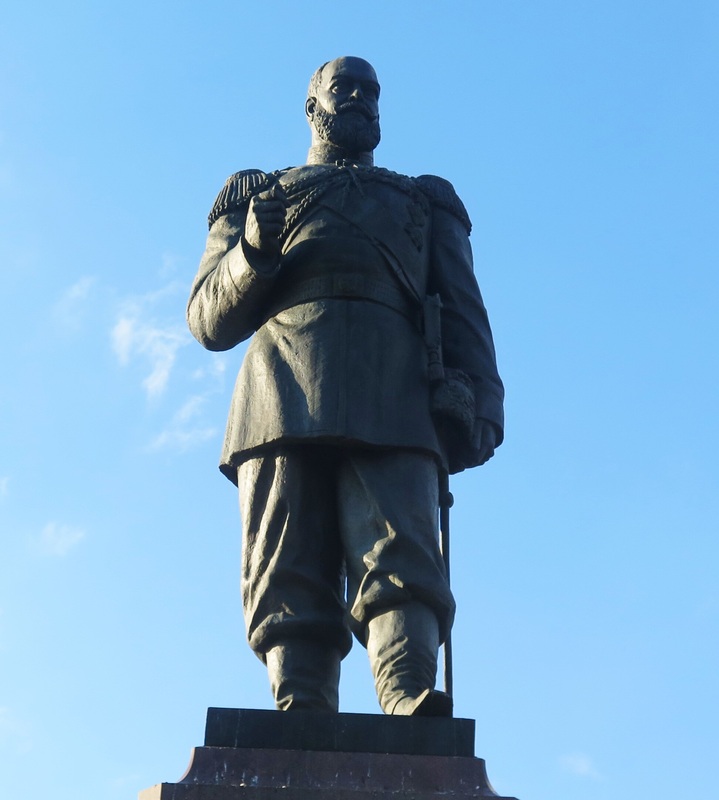 Irkutsk was our first stop in Russia. 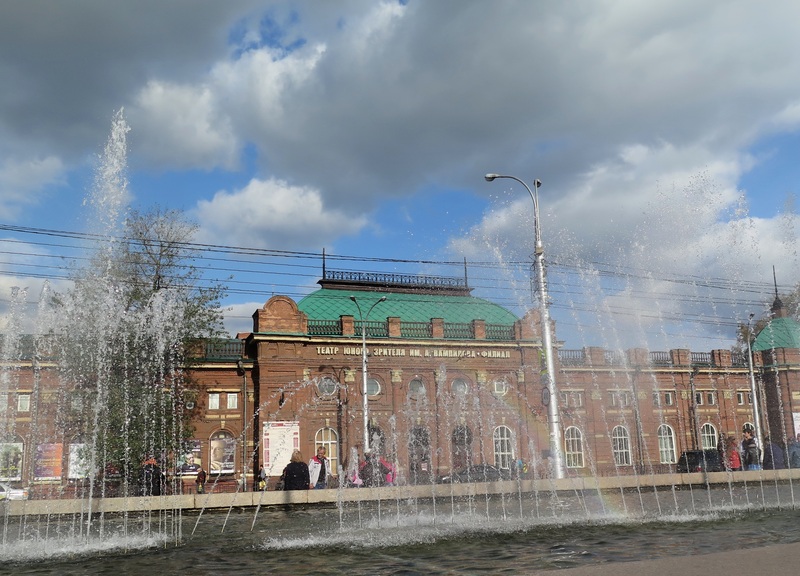 Although we’d seen the Siberian landscapes unfolding past the train window for the past day, I did not really feel like I was in Russia Until I was walking around Irkutsk, taking in the beautiful architecture, hearing Russian spoken by the passersby, pulling my scarf from my bag in the evening chill. 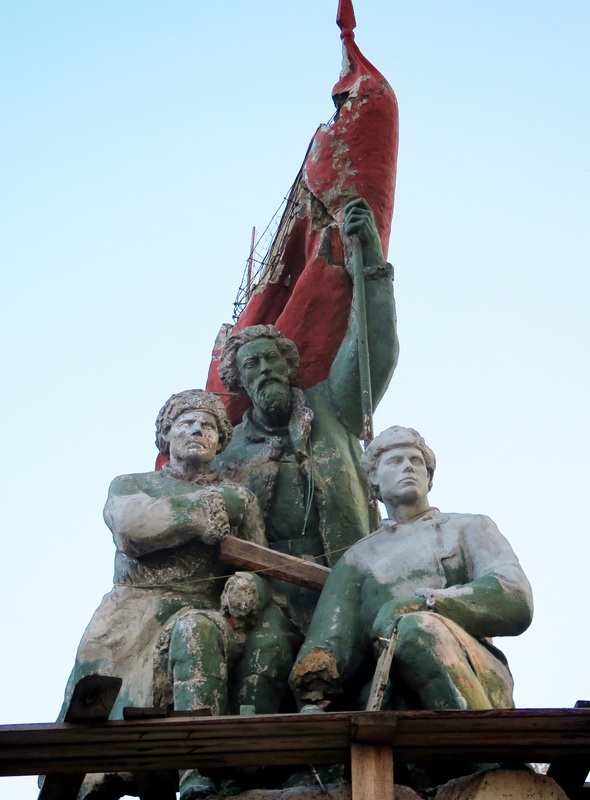 Both Steve and I enjoyed Irkutsk, though we saw only a small portion of the city. My guidebook tells me that there is plenty more that we missed. 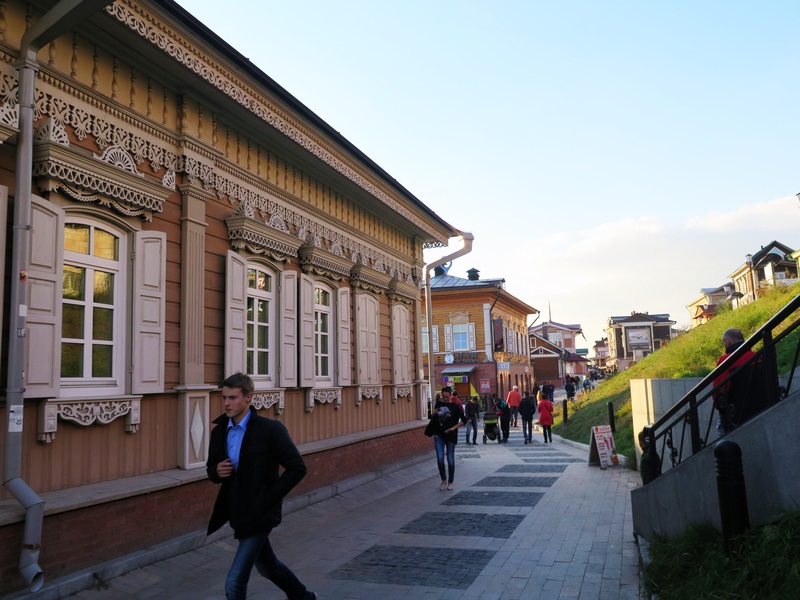 One of the main streets in Irkutsk. Walking through the city after our arrival, I was impressed by the grand buildings on the small streets, and by the more humble, order buildings on the side streets, with their beautiful woodwork. 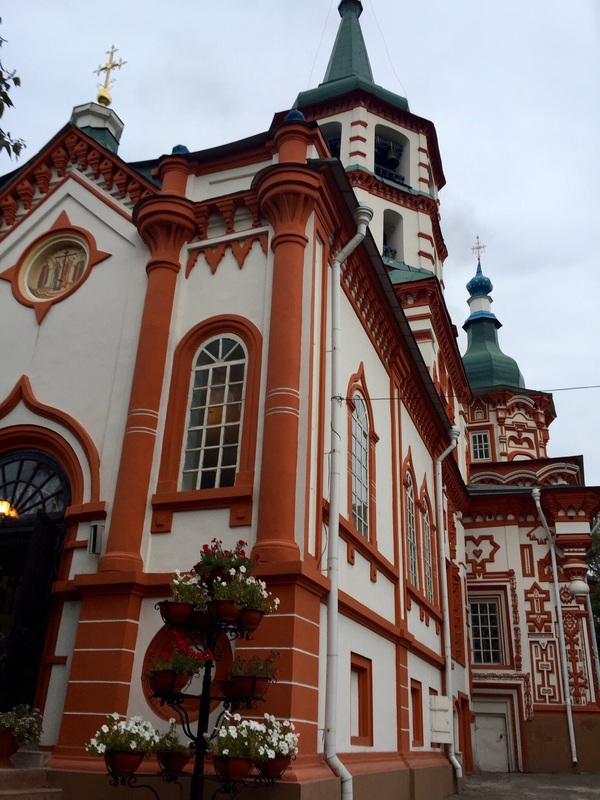 The Holy Cross Cathedral, one of the first buildings we saw as we walked around Irkutsk after our arrival. 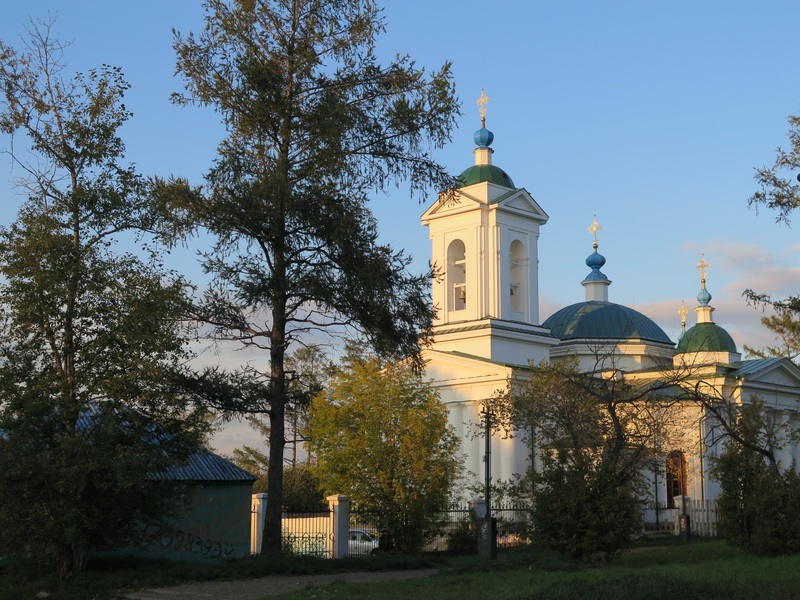 Inside it was a typical Orthodox cathedral. 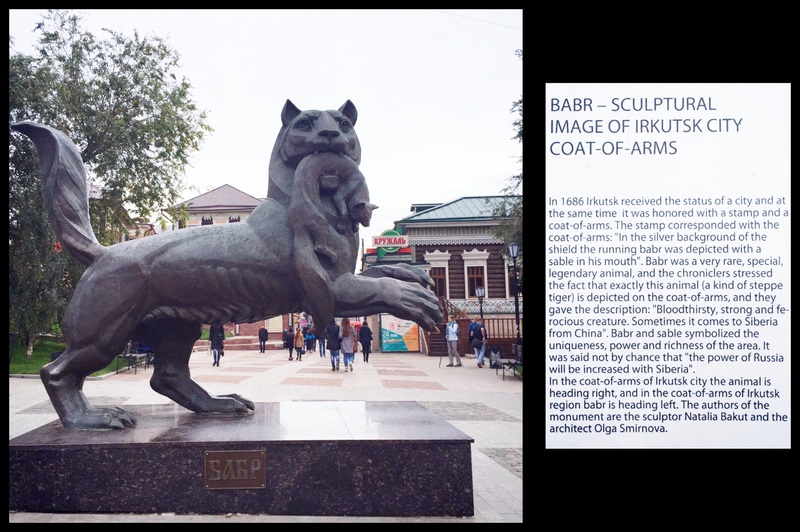 The Irkutsk coat of arms. One of the main restaurant areas of Irkutsk. 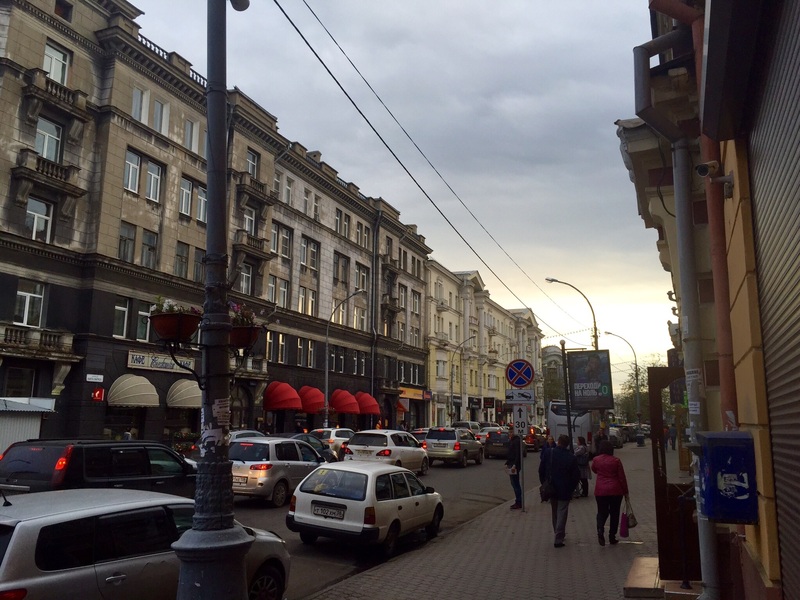 We had dinner along this pedestrian street on both our evenings in Irkutsk. 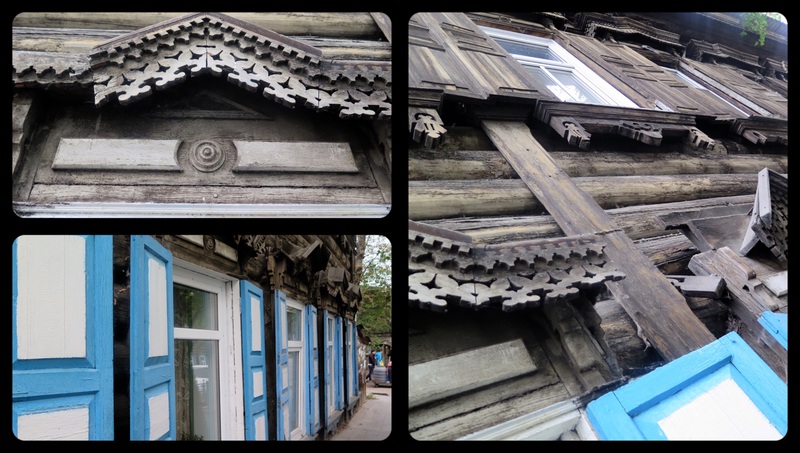 I loved the intricate woodwork and shutters we saw throughout the city. 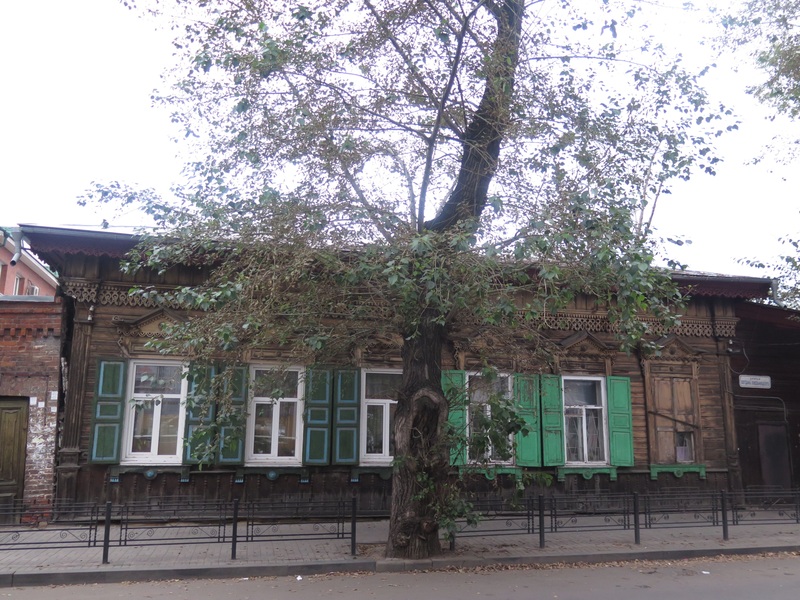 Another typical, lovely building. There were everywhere. 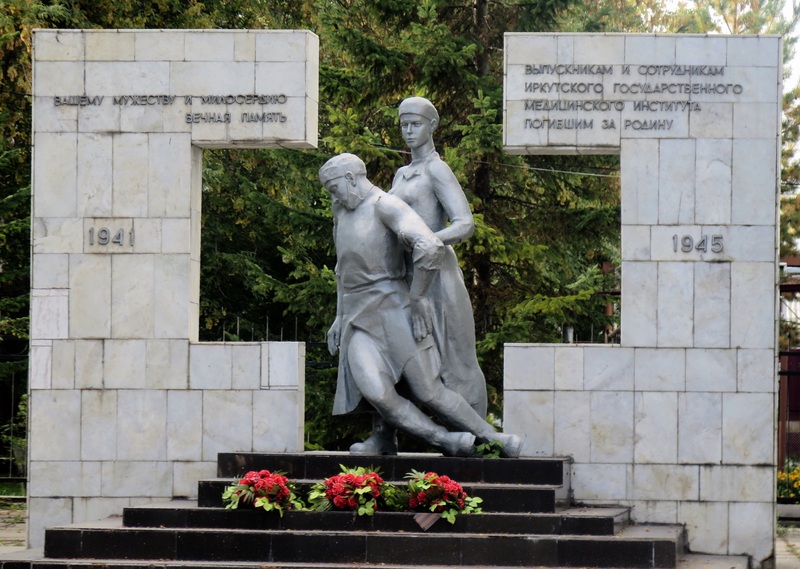 A lovely monument to something….. We passed this in our meanders, but my Russian is not quite good enough to decipher its engraving. From the dates, I would guess WWII. From the statue, I wonder if it’s a memorial to the nurses who helped injured soldiers. 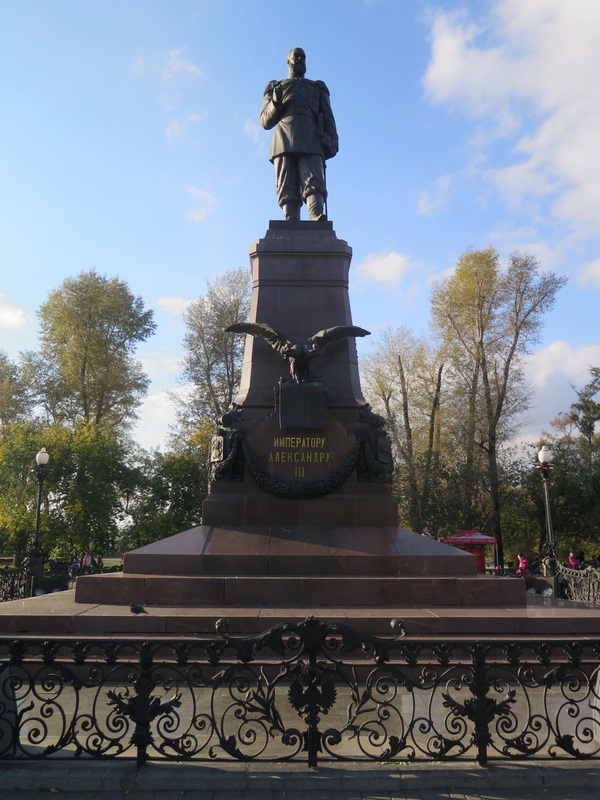 A close up of Tsar Alexander III. 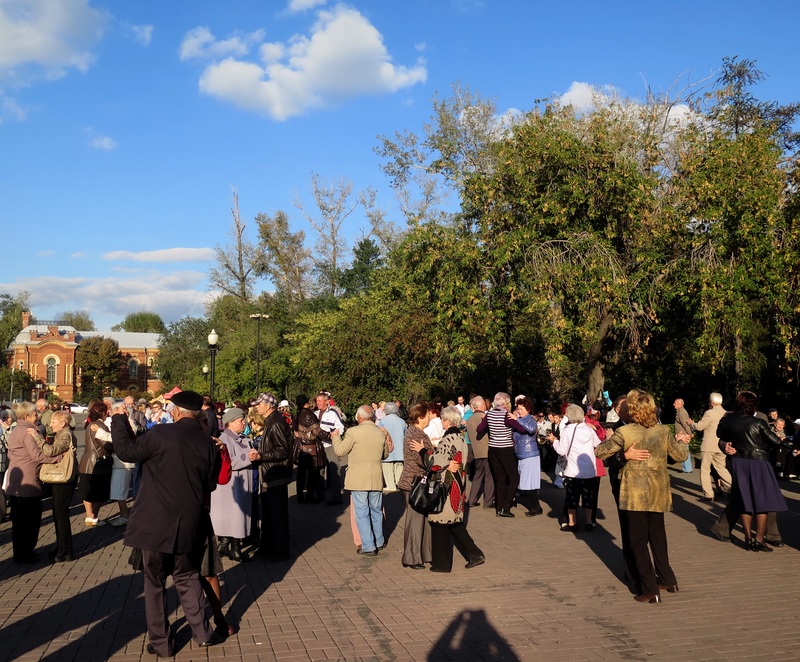 In the square near the monument to Tsar Alexander III, a band played and (mostly elderly) couples danced. 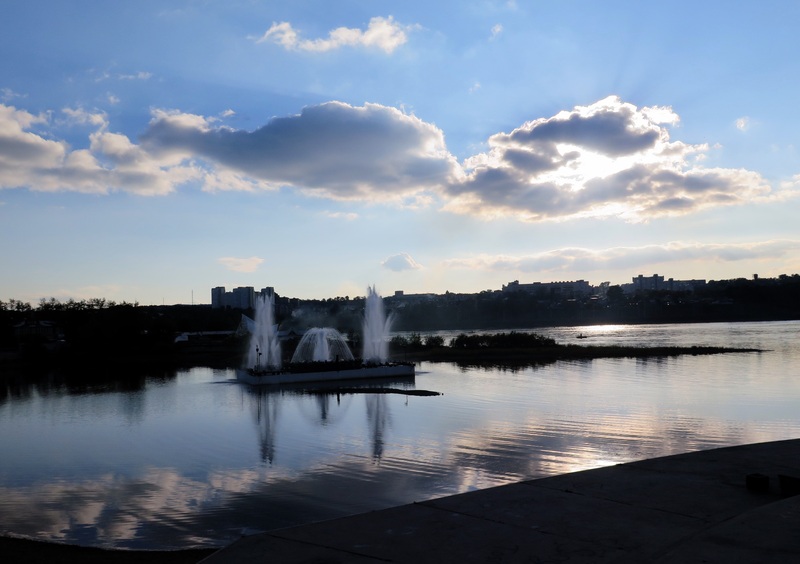 View over the Angara river from the pedestrian walk. 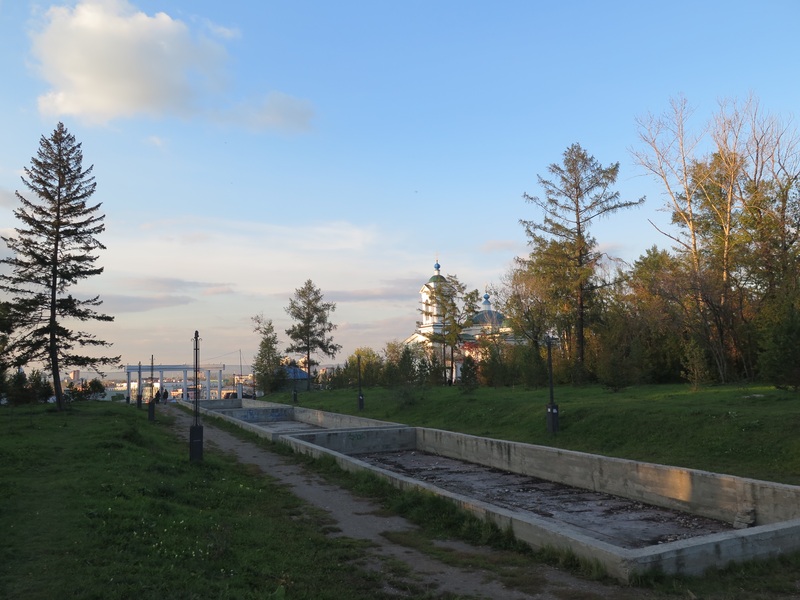 On our second day in Irkutsk, spending time before boarding our late (and long) train to Kazan, we decided to walk through the “Central Park” (as it was described on our hotel map). We were headed to see another dot on the map that represented a church, and thought the walk would be pleasant. The park was strange and run-down, and we commented that we felt a bit uncomfortable walking through it. (We would certainly not want to walk there after dark.) The paths were not so much paths as roads, muddy and irregular. There was nothing pleasant about the park. We spotted the church we were looking for, and were relieved to be exiting the park. On the way out, we found a large sign with the history of the park given in both Russian and English. In other words, we had been walking through a desecrated graveyard. And we had not known it, but had certainly not felt good about the place. This is the “Jerusalem” church, right outside the park that was a graveyard. When we went into this church there was a service in progress. The choir was the most beautiful thing I have heard. The sun through the windows lit the church with an awesome glow. I would have loved a picture to help me remember it, but it was not the time to take photos. 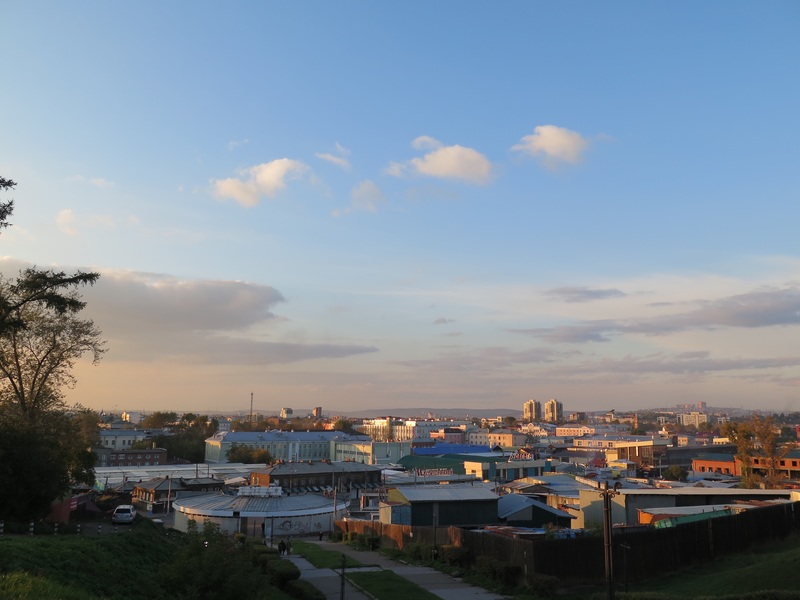 This look back over Irkutsk was impressive in the evening light. I am not totally sure, but believe this is a WWII monument. Although it is crumbling, it is beautiful. 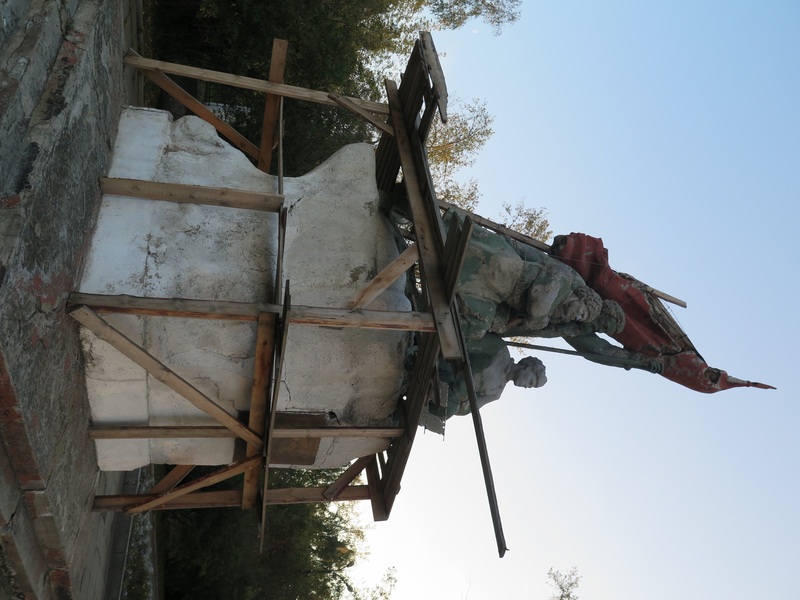 Here is a closer shot of the monument. There is something about the faded colors, aged faces, and in-progress restoration that I find very moving.